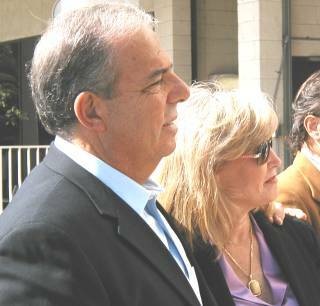 (September 13, 2005) -- Flanked by allies, endorsers and former co-workers, the soon to be former (stepping down Sept. 30) president of Southern CA Edison, 11 year LB resident Bob Foster, officially announced he's running for Mayor of LB. LBReport.com posts extended transcript excerpts of the event below. 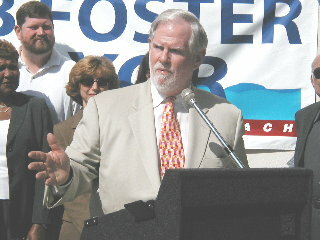 As previously reported by LBReport.com, Mr. Foster's campaign committee ("Friends of Bob Foster") reported collecting over $150,000 in contributions as of June 30, 2005. 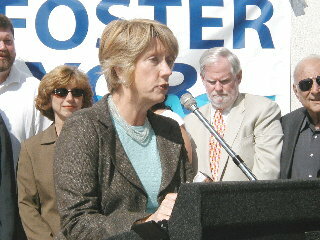 Mr. Foster stood alongside his wife Nancy as his work was praised in introductions by Diane Wittenberg, President of the CA Climate Action Registry; Doug Otto, LB lawyer and member of the LB Community College Board of Trustees; and Brian O'Leary Bennett, a Boardmember of Equality California. Ms. Wittenberg and Mr. Bennett are both former SCE co-workers with Mr. Foster. The Foster campaign also released a statement from State Senator Alan Lowenthal (D., LB-SP-PV) endorsing Mr. Foster's candidacy, which we post verbatim below. 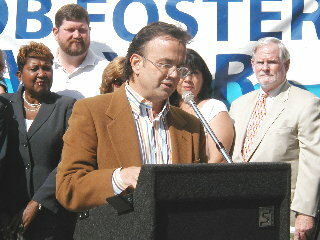 Mr. Foster delivered a Mayoral announcement (which we post below verbatim) and fielded reporters Q&A. 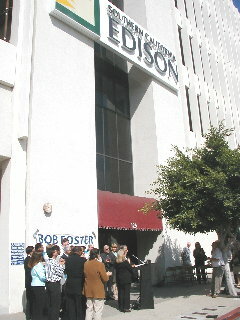 The event was held in the 100 block of Elm Ave. outside the Edison Materials Supply Co., a firm created as part of an agreement reached at the end of the 1990s after now-former city management suggested ending SCE's franchise and creating LB's own municipal electric utility, a suggestion fiercely opposed by SCE. SCE ultimately remained LB's electricity provider, which the Foster campaign calls a "win/win" that brought LB revenue and jobs...and notes that City Hall's contemplated municipal electricity partner was the subsequently collapsed Enron Corp.
Ms. Wittenberg: I'm the president of the CA Climate Action Registry, it's a non-profit that works on global warming issues, I'm also on the board of the Coalition for Clean Air, which works on environmental advocacy for many areas around the state, but works a lot on the Port and LNG issues. And he was always a stand-up guy with the company. When I would go and say Bob, the company needs to do the right thing on this particular environmental issue, he would make sure that that happened. Mr. Otto: I'm here also because of my friendship with Bob and Nancy Foster and it's my honor to endorse Bob and to help him kick off his campaign for the job of being Mayor of Long Beach. ...I think this is a particularly important moment for Long Beach right now. We've had great leadership from Beverly O'Neill and now we need somebody with business experience, with a good heart, a good record on the environment and we're standing in front of the Edison building here today to make this dedication to his candidacy. Mr. Bennett: ...This is a person that I remember because he's a friend first and everything else second. This is my friend, Bob Foster. And if Bob leads this city even half as much as he cares for his friends and his family, I know all of you will appreciate Bob long after he's gone from City Hall for most of the same reasons I love and appreciate him now: his loyalty and his compassion, and occasionally for a good joke. ...Whether it's a family crisis or even an energy crisis, Bob just pushes on through, "white knuckles" it as he calls it. He rarely complains but he never sacrifices his integrity and his goal for short cuts, quick fixes or face-saving. Bob's forever the optimist...He thrives on bringing people together to solve problems. He's also fiercely outspoken on behalf of the underdog, the little guy who's getting a raw deal or who might get a raw deal. Many times in a boardroom or a meeting room -- and it doesn't matter if it was a CEO or one of the most influential elected politicians in this state -- I've been especially proud when I saw that Bob was the lone voice, the unpopular voice, the one who speaks for those voices who couldn't be heard or weren't listened to. And then I watched with pride as Bob changed the minds of the people in those rooms. He's a fighter. He never gives up. He never loses his drive and he never loses his sense of humor. This is the kind of friend and leader that Bob Foster is: so much experience with so much heart. This is one of the many, many reasons that Bob Foster would make a great leader, a great Mayor for our great city. 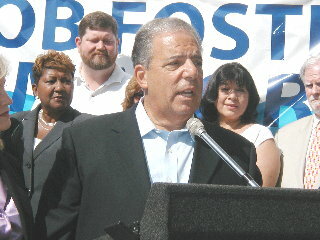 I am proud to support Bob Foster for Mayor. AS a professor, city council member, state assembly member, and now as your senator, I have tried to bring people together to promote the well being of Long Beach, and to solve its most pressing problems. 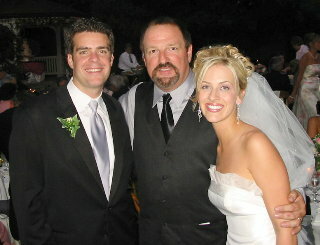 In that tradition, Bob Foster will be an outstanding Mayor. He possesses the leadership skills, the problem solving ability and truly understands that Long Beach's diverse population must be listened to, and asked to participate, if Long Beach is to become an even greater city. 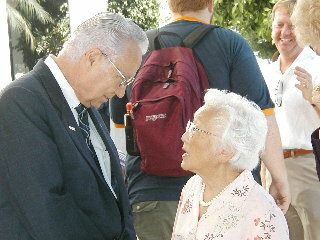 I ask all Long Beach residents to join me in supporting him. Mr. Foster: There are cities in California that are thriving, where people stroll their neighborhoods in safety, where children learn the skills they need to secure their future. And then there are cities mired in distrust, debt and dysfunction, and all too often the difference stems from specific decisions made by elected officials. Policy has consequences. Leadership makes a difference. My life has been dedicated to the idea that I have an obligation to use my skills to make a difference in the lives of our families. As a policy analyst for the State of California, I drafted the energy efficiency standards that made our state a pioneer in the field of conservation -- and those standards are still in effect thirty years later. As a Trustee for the California State University system and the CSU Foundation Board I have worked to make sure that all students who earn it have an equal opportunity for quality higher education. As an executive at Edison, I successfully worked to reduce our reliance on dirty fossil fuels and make Edison a national leader in renewable and alternative energy. I led the effort to beat back the attempt by Enron to seize control of Long Beach's energy future. I made decisions that created jobs and brought over $18 million in sales tax revenue to Long Beach, funds to hire police officers, build roads and repair parks. And today, I am formally announcing that I am a candidate for Mayor for the city I most love. [applause] A city my family and I have called home for 11 years. 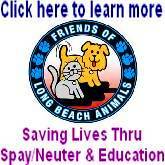 I am running for Mayor of Long Beach. Long Beach is fortunate indeed. We sit at the threshold of the future. We're the nation's preeminent port, the place where America links to the world. We have a remarkable and talented population, great institutions of higher learning, a strong diversified economy with burgeoning trade, health care and tourism sectors. But it is not enough to be fortunate. Serendipity is no substitute for leadership. As Mayor, I will provide the leadership to put our city's fiscal house in order. Right now, our fiances are precarious at best. We need to institute long-range budgeting that recognizes that we cannot make decisions today that will beggar our children tomorrow. I will provide the leadership to find ways to increase the size of our police department so we can truly initiate neighborhood policing, to improve our emergency preparedness and to stiffen our resistance to terrorist attack. I will provide the leadership to unite the city, and the public and private sectors of our school district to enhance educational opportunities and give our children a better future -- and to provide our economy with the skilled workforce we need in an increasingly competitive world. I will provide the leadership to help revitalize our commercial corridors and strengthen our neighborhoods. And I will provide leadership to return civility and a sense of common purpose to local government. The diversity of opinion in our city is a strength, not a weakness. It is the job of a leader to extract the common strain from the discordant chorus, to engender mutual respect and forge consensus. Mr. Foster: No, I'm trying to make a point that we're at a crossroads, you have two paths to go and we don't want our city to become that. 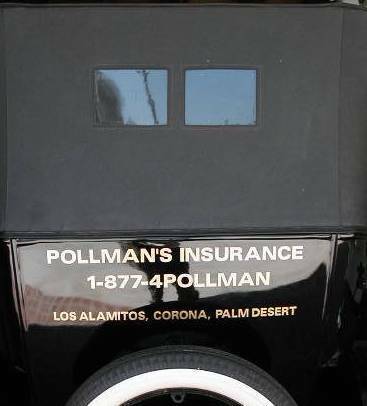 We've got problems, they can be tackled. I think if we can build on the positive base that Mayor O'Neill has built in terms of people feeling prideful about their city, we can solve our problems. We do not want to become that city I described. LBReport.com: ...In the 11 years that's you've lived here, could you name three important votes by the City Council that you disagree with? Mr. Foster [interjecting]: I don't want this to be a contrasting with Mayor O'Neill. I have a lot of respect for her, I mean that sincerely, I think she's done a great job for this city. I have a little different personality. For me, I really thrive on being able to say what I think and mean what I say in terms of positions in the city, and I expect I will take positions and try to lead the City Council in a direction to benefit the City. But you know, this isn't a contrast thing. I mean, she started Mayor in this town, you gotta go back to when it was, I mean we lost the Navy, we lost the aerospace industry. She really did a marvelous job being able to build civic pride. And you can quote me on this: You cannot have civic improvement unless you have civic pride first, and she deserves all the credit in the world for that, and we ought to build on that. LBReport.com: The LNG issue came up in one of your speakers. In 2003, the Mayor [in a Port press release indicated]...the Port had done the right thing by entering into an agreement [an MOU to facilitate the LNG application] which was long before an EIR. Would you have done that? Mr. Foster: I'm opposed to the LNG facility in Long Beach...I'm in favor of having the EIR worked on and I certainly want to complete the process, but for me personally, this is something I know a little bit about, I think LNG facilities are safe, I've visited them around the world, it's not something that I'm afraid of. But in a heavily urbanized area, in a post-9/11 world, it simply does not make common sense to me to put an LNG facility in Long Beach. And I think there are alternatives. 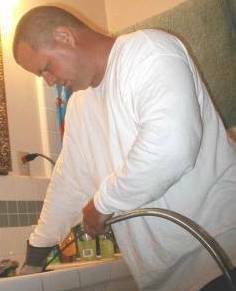 California needs natural gas, I'm going to tell you that, I understand that, we're heavily reliant on it for electric production and we're reliant on it for winter heating, so we need more sources of natural gas, but there are alternative ways of getting it here. To me, and I'm not prejudging this, but one that looks attractive to me, is the one that's off Ventura County in Oxnard...and they want to put it 15 miles offshore and then pipe the gas in...Look at all the mitigation there. You're mitigating any terrorist attack or any incident that could damage the facility, all the environmental impacts are mitigated substantially and it's much safer, so I think that's a better alternative. LBReport.com: One of the policy disputes in recent years has been between the Port and Long Beach City Hall, they've sometimes taken policies that are conflicting. If there is a conflict, which should prevail, the City or the Port? Mr. Foster: My job is to make sure this city is safe and thrives economically, that's job one. The Port is a terrific economic engine for Long Beach and more importantly, one of the things I've very concerned about is, they're also the resource to be able to help clean up some of the environmental impacts from the Port. And they've started in that direction, I think you have to give some credit to them, they've started the Pier Pass program, and they're talking about Cold Ironing ships. They have set aside a significant amount of dollars for environmental enhancement. I'd like to work with the Port, for example to increase the Carl Moyer program to get dirty diesel trucks off the road. That to me, it's the most cost effective program you have. They [the Port] can be a real ally, but that Port and some of its environmental consequences have health effects for citizens of Long Beach, that comes first. LBReport.com: So on [State Senator] Alan Lowenthal's bill, the no-net-increase [in Port related air pollutants] bill, the City Council voted twice to endorse it, the Port opposed it once, what would you do in a case like that if you were Mayor? Mr. Foster: You know I'm sympathetic to what Alan wants to do and he's endorsed me, he's a good ally, I want to look at the consequences of that before I really make a decision on it. But I've talked to both Alan and I've talked to the people at the Harbor and I think there's a common purpose here. This is one of those things I've talked about. And I've told people on the Port, I think Alan is pushing them to do more, and he's right in doing that, I'm in agreement with that. I think the Port's starting to get the message and I think they're now starting to put resources behind their effort. We've got to do a lot more, and whether it's Alan's bill or some other effort, we've got a lot to clean up here. Mr. Gewirtz, PT: You mentioned the need for increasing the police force. Would you support a tax measure to accomplish that or how would you...? Mr. Foster: Let me put 'em in order, okay, first of all, there's no question we need more police in this city. I think as a good start, I think Chief Batts put, one of the formulas he put together, one of the plans put together was I think Plan 2 with 127 officers, that's a good start. We've got to find the money, and I think there are efficiencies in city government we ought to look at. I think you have to do as much as you can to be as efficient as you are. As a last resort, you may have to go to the voters for additional revenue, but it would only be as a last resort. Look, safety is number one. You guys, you know this, safety is number one. If you're not safe, you can't have a good economy, you can't protect your citizens, you can't do anything, so we've got to find the money. LBReport.com: There's a fundraiser tonight at Keesal, Young and Logan [prominent LB law firm]. Pesky reporters like us won't be able to get hold of those numbers [naming contributors and amounts contributed at the event] until February . Would you campaign be willing to release those in a few weeks, just the names and the numbers?